Info "Remove the colo(u)rs and what's left?" Hue-Down is a downloadable microgame in WarioWare: D.I.Y. and WarioWare: D.I.Y. Showcase. It was released on July 1, 2009 in Japan, May 31, 2010 in North America, and July 2, 2010 in Europe. Its name is a pun on hoe-down. 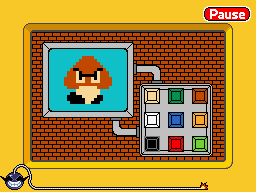 In the game, there is a screen and a color pad (with the colors black, white, red, light green, dark green, yellow, peach, orange and blue) on a brick background. On the screen, there will be one of four 8-bit objects from Super Mario Bros.: Mario, Luigi, a Goomba or a Mushroom. The player has to 'sap' the color from these objects by tapping the respective colors on the color pad. Each object is only made up from three colors. For example, for Mario, the player must tap brown, red and yellow in any order. If the player taps all the correct colors, the game will be won. If they tap one wrong color, the game will be lost. This page was last edited on February 22, 2019, at 19:26.